Here’s an easier way to make training plans. 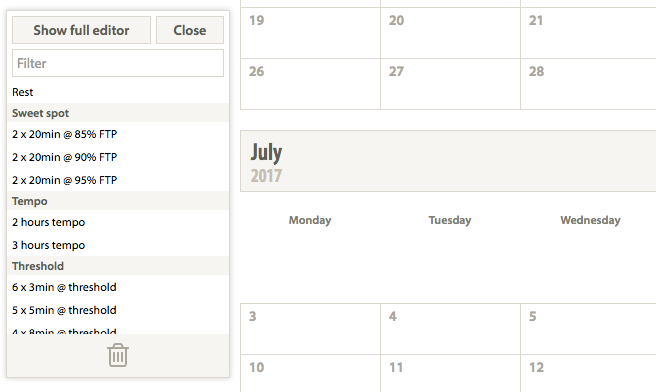 Plans can now be dragged directly from the training plan library and onto the calendar. Clicking on “plan library” now reveals a list of training plans, which can be dragged and dropped onto the calendar. It’s normally taller than in the screenshot above, but I wanted a picture that includes the top and bottom. Holding the mouse over a plan for a moment reveals the details of the plan. Typing something into the “filter” searches for plans by title or group. Clicking on “show full editor” brings up what clicking on “plan library” used to. Drag from the plan library to the calendar: adds the training plan to the day. Drag a plan from the calendar to another day on the calendar: move the training plan to the new day. Drag a plan from the calendar to another day on the calendar while holding down control/alt/option/command: copy the training plan to the new day. Drag a plan from the calendar to the “rubbish” area at the bottom of the plan library: delete the training plan from that day.